Movie Model 'Grace' handmade card for a special person. This cream deckle-edged card 126 x 178 mm (5" x 7") has a background of lilies on acetate. 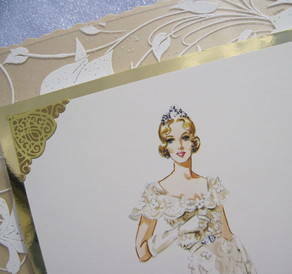 A fashion drawing of a lady in a long cream gown is matted onto gold mirror card and has gold heart-shaped celtic corners to emphasize the dimensional design. Please select your chosen greeting for the printed paper insert. A name or age can be added to the front if you wish.